The main goal of our research was to identify the features of the spatial distribution of crustal movements in Ukraine using GNSS technology. Methods. As the initial date for investigation were the observations of 4 years (2013-2016) from over 120 reference stations in Ukraine. The cumulative solution was estimated by program GAMIT/GLOBK. For reference (real), we have taken solutions from EPN Analysis Combination Centre. By comparing the real coordinate and coordinate determined in our cumulative solution we compute RMS of the positioning. Results. The RMS analysis revealed that the received cumulative solution may be used for regional and local geodynamic studies, geophysical interpretation and for many practical applications in geodesy. Based on the estimated horizontal components of velocities, their vectors were constructed on the digital tectonic map of Ukraine. Horizontal rates (22-25 mm/yr) show a clear trend - a dextral character. Movement components are in the direction of Voronezh crystalline massifs. For the vertical component of the relative site velocities, accuracy will increase with an increase in the time interval of GNSS observations. Scientific novelty and practical significance. For the first time the digital tectonic map of Ukraine was prepared with vectors of horizontal velocities of GNSS stations. The values of the determined velocities are homogeneous and with the increase of the observation interval, it will be possible to determine the peculiarities of the movements of the earth crust on the territory of Ukraine and in the future to create a regional geodynamic model of Ukraine. 1. Altamimi, Z., Angermann, D., Argus, D., Blewitt, G., Boucher, C., Chao, B., Drewes, H., Eanes R., Feissel, M., Ferland, R., Herring, T., Holt, B., Johannson, J., Larson, K., Ma C., Manning, J., Meertens, C., Nothnagel, A., Pavlis, E., Petit, G., Ray, J., Ries, J., Scherneck, H.-G., Sillard, P., Watkins, Moscow: 2001, The terrestrial reference frame and the dynamic Earth. Eos Trans. AGU 82(25):273–279, doi:10.1029/EO082i025p00273-01. 2. Altamimi, Z.: 2003, Discussion on How to Express a Regional GPS Solution in the ITRF, Proceedings of the EUREF Symposium, Ponta Delgada, 5 June 2002, Verlag des Bundesamts für Kartographie und Geodäsie, Frankfurt am main. 5. Chen, Y., Ding, X., Huang, D. and Zhu, J. A Multi-antenna GPS System for Local Area Deformation Monitoring. Earth Planets Space, 2000, 52, 873–876. 6. Fastellini, G., Radicioni, F., Stoppini, A.: 2009, Impact of Local GNSS Permanent Networks in the Study of Geodynamics in Central Italy. 7. Herring, T. A., King, R. W., Floyd, M. A., McClusky, S. C. Introduction to GAMIT/GLOBK. Release 10.6. Department of Earth, Atmospheric, and Planetary Science MIT, USA, 2016, 44 p.
8. Kaloop, M. R. and Li, H. Tower bridge movement analysis with GPS and accelerometer techniques: Case study yonghe tower bridge. Inform. Technol. J., 2009, 8: 1213–1220. 9. Kutoglu, H. S. Datum Issue in Deformation Monitoring using GPS. Proceedings of FIG Congress 2010 on Deformation Measurement using GNSS Commission: 5 and 6, Sydney, Australia, 2010, April 11–16. 11. Rutledge, D., Gnipp, J. and Kramer, J. Advances in Real-Time GPS Deformation Monitoring for Landslides, Volcanoes and Structures. Proceedings of 10th International (FIG) Symposium on Deformation Measurements, Orange, CA, 2001, 110–121. 13. Seeber, G. Satellite Geodesy, 2nd Edition. Walter de Gruyter GmbH & Co. Berlin New York, 2003. 14. Somov, V. I. Sovremennyye dvizheniya zemnoy kory zapadnoy poloviny Vostochno-Evropeyskoy platform [Modern movements of the earth's crust of the western half of the Eastern European platform]. In: Geodinamika i seysmoprognosticheskiye issledovaniya na Ukraine. Kyiv: Naukova dumka, 1992, pp. 118–127 [in Russian]. 15. Somov, V. I., Rakhimova, I. SH. 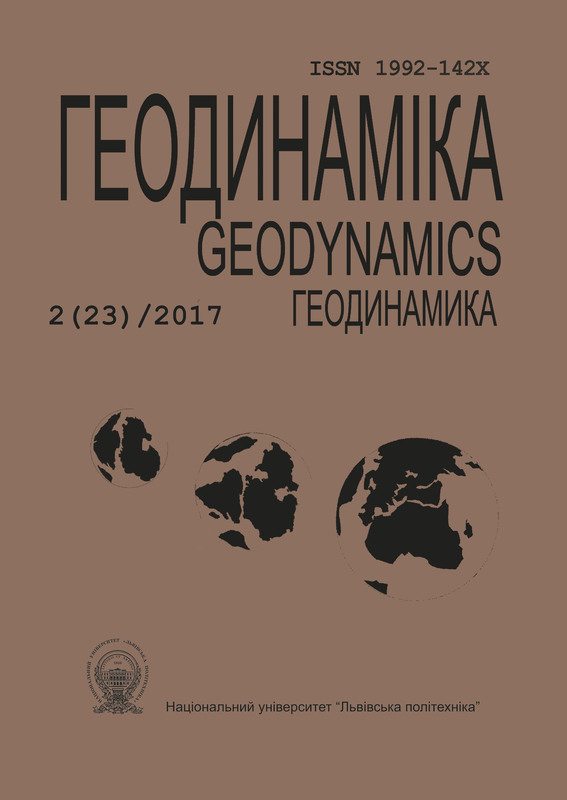 Geodinamika i strukturnaya evolyutsiya zemnoy kory Karpato-Balkano-Dinarskogo regiona [Geodynamics and structural evolution of the earth's crust of the Carpathian-Balkan-Dinar region]. Geodinamika i seysmoprognosticheskiye issledovaniya na Ukraine. Kyiv: Naukova dumka, 1992, pp. 128–144 [in Russian].